This pose stretches the back, hips, and ankles. It stretches the inner thighs. It also brings blood to the head to clear the mind; Butterfly pose soothes menstrual discomfort and sciatica. It brings the blood to the pelvic region to tone the reproductive organs, and tones abdominal organs. Therapeutic for flat feet. 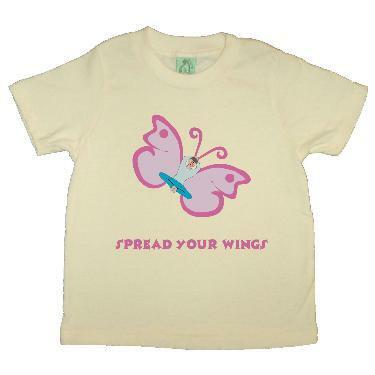 Children's fine garments from BuddhiWear Organics run true to size but are not pre-shrunk. If your little one is in-between sizes order up one size to allow for shrinkage, (will shrink an average of 1/2 size in the wash). The tank tops shrink a little bit more than the other garments but they are also very stretchy, please take this into account when ordering.